One of those hotter than blazes summer days. I was musing that it would have been sad for the summer to end without a few little firecrackers to remind us that it is and has been summer. We all are trying to do stuff and are dragging around with the heat. The breeze is blowing however, which makes it slightly more bearable. Back to the spa water in about 20 minutes to lower the core temperature. The hosta we have in front of the house are beginning to bloom--big 6" long white trumpets that exude the most amazing fragrance. I have tried to identify the species...and they never get into the nuances that are needed so as to match what we have. These plants are beasts--always giving more when I chop away in the spring (quite nastily) to cleve the plants "for their health"--and more like in greed to have more of these lovelies. Beautiful beasts none the less. The hosta I threw in lakeside adore being there...so the hosta snacks that are being consumed by Bambi et al (quick...the gun! )are making a 15 minute trip north and will, next summer be residents of the lake. The water was crystal clear, brisk and heavenly this morning. We all tread water and threw sticks for the dog. The only really scary thing about being in the clear water is seeing the big, floppy carp that like to swim along with us. 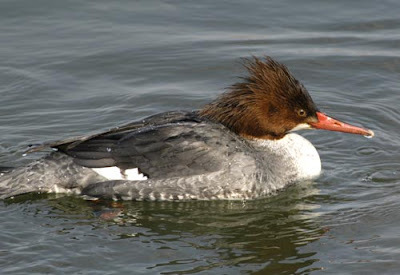 Mother duck and ducklings were making the rounds along with a duck Kitty proclaims is a common merganser. I am chipping away at all the little places that collect crap, litter, old ikea parts etc along with the random crayon, bead, rubberband, snippets of this and that. Out, out out. Musty yarn> good bye! Broken pots, rusty dull shears. See ya! Old magazines that reinforce my Rip Van Winkleness. Paperbacks that have been read...and will not see the light of day. Books given to us that none of us will read. Old pads of paper with 2 sheets of paper in it. And of course, my favorite, the thousands of used double and triple A batteries that haven't grown legs to walk to the trash can.It is a good week of stuff clearing, but it is cathartic to begin this process. Going to make a lemon bagna calda with blanched green beans, and a Mango/Key Lime Pie along with steamed and cold local produce and some grilled chicken for friends tomorrow. Need to see the vegetable man at the top of the hill to see what else he has to offer. Blueberries? Peaches? Tomatoes? Kitty and I are eyeballing a curried pea soup (cold) in the July Gourmet...maybe that for later this week? And there is a blueberry "pudding" that looks delightful as well. A's birthday is next Saturday--so thinking about food for that is inline...however, stuff with anchovies, capers or anything wierd is off the list.